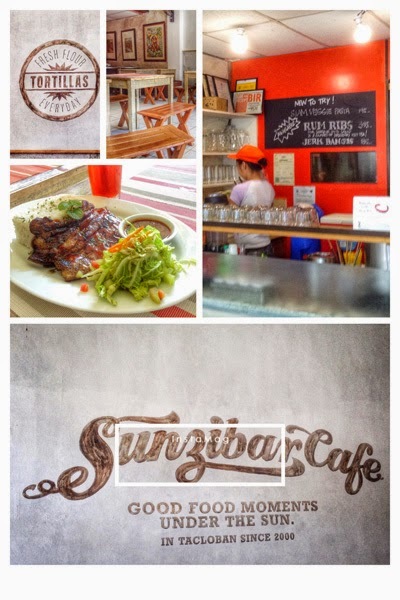 Sunzibar, located at Burgos across Habagat, the outdoors store, has Tortillas freshly made every day. Though the menu goes across the board from Mexican, Italian and Asian dishes perhaps it’s the Tortillas that bears their flagship. I had the barbecued pork belly; it had a good flavor, the fresh salad was a nice touch too. My companion had Quesadillas and Beef Teriyaki. We liked all of it despite the wide range of flavors and the red berry ice tea was refreshing. I am now beginning to see why most restos in TC are like Jules Verne’s novel "Around the World in 80 Days" in terms of flavors as opposed to honing on to a specialty, I believe this is the case so that eateries will have the ability to accommodate the restless palate of the Taclobanons that swing from that kind to this kind of cuisine at any given time. The interior deco here is mostly rustic with hard wood as their canvass and the Diego Rivera-inspired paintings makes for colorful accents. Amenities like the bathroom are to be raved about, we all appreciate it when establishments care in this manner. I was told that the owners of Sunzibar are the same as Canto Fresco and that they share a kitchen. I observed one customer order pizza from Canto and I think that versatility is a plus; there is no WiFi connectivity. With Sunzibar's longevity (from 2000), I am sure people have already checked this joint out numerously and that’s a good thing!